The Thomas FX snow studio is currently manufacturing a blizzard of fake snow. Early in January we doubled the manufacturing capacity of our snow studio to keep up with strong customer demand. We have been working overtime, as late as 1:00 am some nights as well as some Saturdays, to fill orders for our Patented SNO-FX! fake snow products. This photo was taken on Saturday. 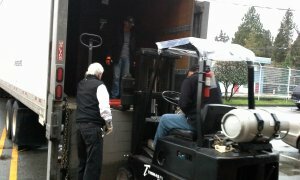 It shows Thomas FX Owner, John Quee loading a USA-bound trailer with SNO-FX! Driving the forklift is the new Thomas FX Operations Manager, Brett Rafferty. Also shown in the photo is teamster Driver Bill Crivel. Bill is on the crew of The Hateful Eight and is picking up the movie's snow at Thomas FX then driving straight to the show's Colorado set. As a point of interest, Bill was also the personal driver for Richard Dean Anderson while he was filming the TV hit MacGyver in Vancouver. Thomas FX provided production supplies to the MacGyver shoot so having Bill driving for The Hateful Eight made it all seem like an old time reunion.